Tennessee’s Nathan Ramsey was no stranger to the starting line. His career spanned two decades, from his beginnings as a hot-shoe rookie in 1994 to his retirement following the 2009 Supercross series. He finished on the podium a total of 33 times in the 125 Supercross, with his crowning achievement coming in 1999 when he captured the 125 West Supercross title. Ramsey specialized in 125 Supercross. He only competed four seasons in the 250/450 class, although several other years he split time between classes. Supercross had grown exponentially since Jeremy McGrath popularized the sport. Outside sponsors poured in almost as quickly as fans did to stadiums around the country. The focus had turned from the rough-and-tumble National circuit to Supercross’ easily digestible and spectator-friendly environment. Nathan Ramsey’s rise to stardom in Supercross couldn’t have come at a better time. He was a desirable addition to championship-caliber race teams of the era Ramsey rode for Pro Circuit Kawasaki, Yamaha of Troy, Factory Honda, Factory KTM and the now-defunct San Manuel L&M Yamaha team during his years in the paddock. Aside from having loads of talent on a motorcycle, Nathan was also an experienced test rider. He was responsible for developing several influential modern four-strokes. In fact, Ramsey was the first rider to race the Yamaha YZ250F, Honda CRF450, Honda CRF250 and KTM 250SXF. Ramsey’s role in promoting the Honda CRF450 became one of his greatest accomplishments. 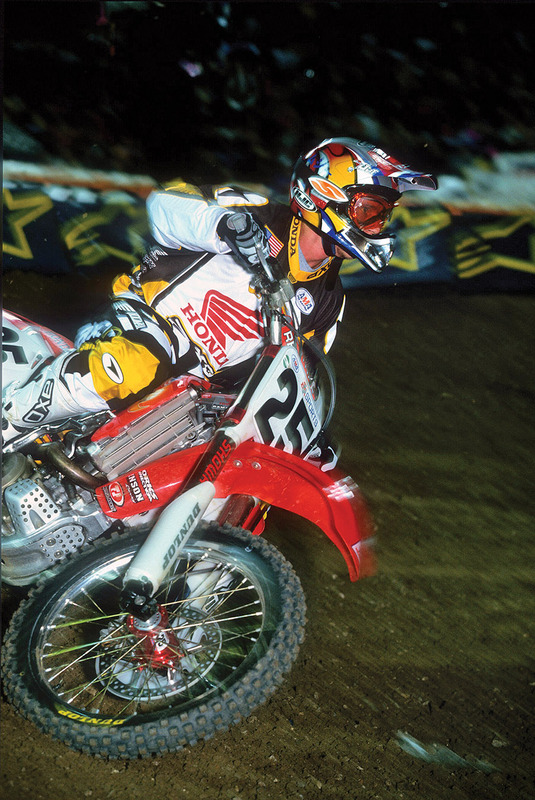 He became the first racer to win a 250 Supercross on the unproven CRF450. Motocross historians fondly recall that fateful day at the Pontiac Silverdome on April 13, 2002. Nathan Ramsey’s teammate, Ricky Carmichael, came into Michigan on a six-race win streak; however, Ricky looped out off a jump in the opening stages of the race and slammed into the ground. His helmet visor broke and hung in his face for most of the main event. Meanwhile, a six-rider battle ensued up front. With Carmichael playing catch up, the rest of the field fought frantically for the win. Then the front-runners started dropping like flies. Sebastien Tortelli crashed first, followed shortly after by Nathan Ramsey and then Ezra Lusk. Tim Ferry inherited the lead and widened the gap. Meanwhile, Ricky Carmichael clawed his way up to fourth in a gutsy ride to preserve his points lead. Then Ferry crashed in the closing laps and Nathan Ramsey took over the top position. Ricky made quick work of Jeremy McGrath and closed in on Ramsey. He cut Nathan’s 3-second lead down to a bike length and pulled up to his teammate’s rear wheel on the final lap. Nathan Ramsey held strong and crossed the finish line for the only premier Supercross win of his career. Carmichael finished second and McGrath rounded out the podium. A jubilant Ramsey was quoted after the wild main event as saying, “I got a good start and things were happening everywhere on the track. I probably wasn’t the fastest guy out there tonight, but somehow I stayed out of trouble and came across the line first.” It was the first time a 450 four-stroke had won a Supercross race since five years prior when Doug Henry rewrote the record books by winning the 1997 Las Vegas Supercross on a YZ400. Believe it or not, Henry was in attendance the night Ramsey won. Nathan gushed, “We four-stroke riders have to stick together.” Times certainly have changed. Chad Reed was the last rider to win a premier Supercross on a 250 two-stroke—three years later. But, that’s another story for another time.